Are you an aspiring entrepreneur looking to build a successful venture while at Stanford? 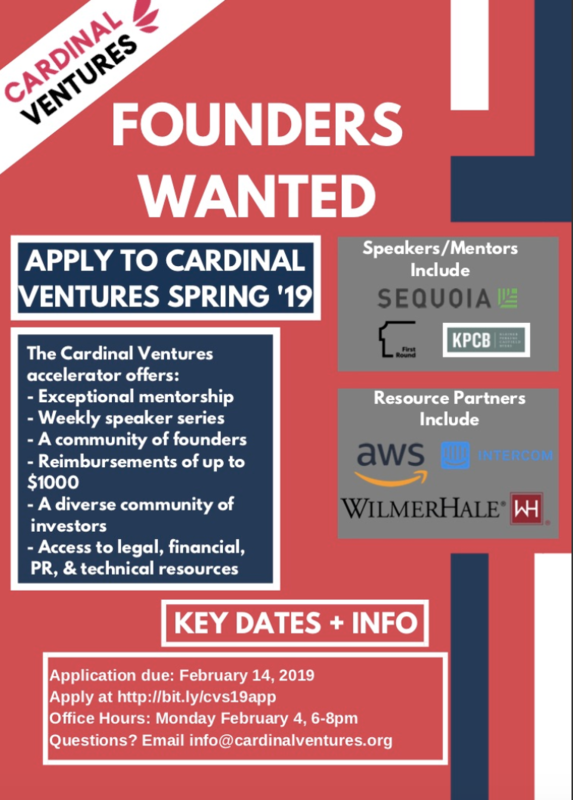 Apply to Cardinal Ventures Spring Cohort! At Cardinal Ventures, we’re passionate about supporting student founders with disruptive ideas. We provide our founders with mentorship, access to resources, and a network of diverse investors and over 200 alumni founders. Since 2015, we’ve graduated over 90 companies who have raised $80M+ in funding from top tier Venture Capital firms like Sequoia, angels like Marissa Mayer, and have gone on to join accelerators like Y-Combinator. Our founders represent Stanford’s immense talent at all levels – undergraduate, graduate, post-doc and alumni. We are looking for passionate founders to join our community this spring. Now in its 6th year, with over 200 alumni, the program is designed to enable young, technology savvy entrepreneurs to work full-time with the guidance of seasoned venture capitalists and other successful founders on building all aspects of a business from the ground up. Applications for the Spring Cohort are due Wednesday, February 14th.